The clubof.info Blog: Utopistics: is it time for an alternative social system? Utopistics: is it time for an alternative social system? Can and will there be an alternative world-system? In social science, this is what the emerging field of utopistics is for. Utopistics is a necessary field, because of the crisis-ridden nature of our present economic system and the fact it is constructed of injustices and exploitation. 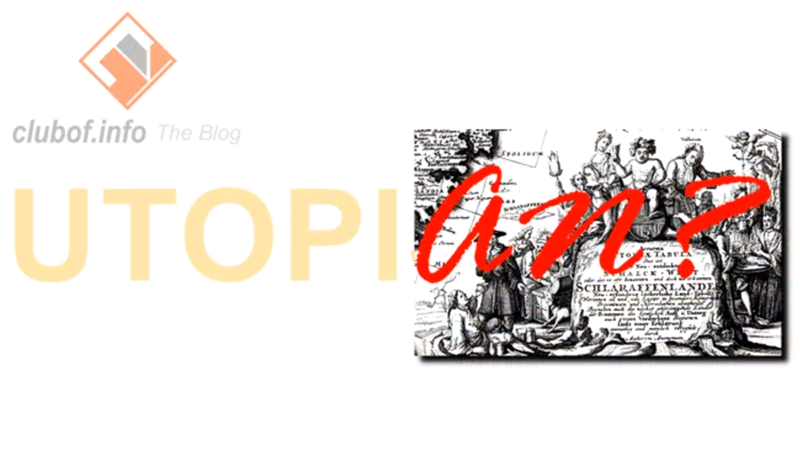 Part of world-systems analysis or world-systems theory (a theory of International Relations from Immanuel Wallerstein), utopistics focuses on paradoxes and choices that will lead to the transformation of present world political and economic relations. Current reigning economic and political theories focus overwhelmingly either on a nationalist-protectionist settlement of perceived faults and injustices in the global economy or - conversely - the neoliberal model of hyper-capitalist globalization and US political dominance. Anti-systemic movements are movements of minorities, anti-imperialists and the political left, aimed at securing a non-capitalist economic model. While their grievances against injustices and exploitation are clear, such movements are perceived to not offer a clearly defined alternative to the current neoliberal economic consensus. It is this alternative that utopistic study could produce. It appears that parties of the political left give little heed to the works of sociologists at present and derive their ideas mainly from other prominent economists, such as Mariana Mazzucato in the case of the UK's Labour Party.